Abstract. Greenhouse-gas emissions have created a planetary energy imbalance that is primarily manifested by increasing ocean heat content (OHC). Updated observational estimates of full-depth OHC change since 1970 are presented that account for recent advancements in reducing observation errors and biases. The full-depth OHC has increased by 0.74 [0.68, 0.80] × 1022Jyr−1 (0.46Wm−2) and 1.22 [1.16–1.29] × 1022Jyr−1 (0.75Wm−2) for 1970–2005 and 1992–2005, respectively, with a 5 to 95% confidence interval of the median. The CMIP5 models show large spread in OHC changes, suggesting that some models are not state-of-the-art and require further improvements. However, the ensemble median has excellent agreement with our observational estimate: 0.68 [0.54–0.82] × 1022Jyr−1 (0.42Wm−2) from 1970 to 2005 and 1.25 [1.10–1.41] × 1022Jyr−1 (0.77Wm−2) from 1992 to 2005. These results increase confidence in both the observational and model estimates to quantify and study changes in Earth's energy imbalance over the historical period. We suggest that OHC be a fundamental metric for climate model validation and evaluation, especially for forced changes (decadal timescales). 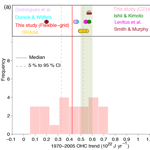 How to cite: Cheng, L., Trenberth, K. E., Palmer, M. D., Zhu, J., and Abraham, J. P.: Observed and simulated full-depth ocean heat-content changes for 1970–2005, Ocean Sci., 12, 925-935, https://doi.org/10.5194/os-12-925-2016, 2016.